Today is the 8th day of ‘Let’s Discuss’ program. For those who are not aware of this program, let me tell you what it is. It’s like a virtual group discussion. we’ll give you a GD topic on every Tuesday. Go to the embedded youtube video and express your thoughts on the topic by tomorrow morning 10 o’ clock. We’ll read each and every comment and we’ll pin the best comment. The aim of this program is to create a platform for students to express their views, to learn from the opinions of others and to finesse their articulation skills. 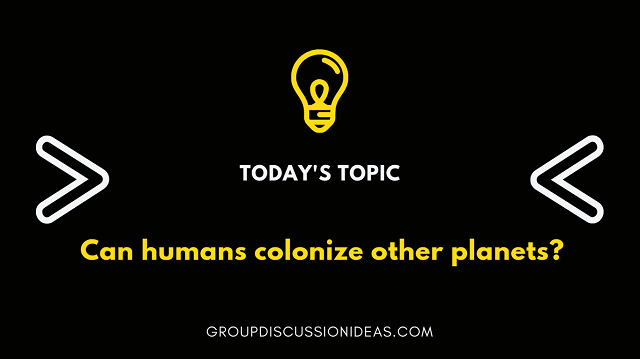 The topic is mentioned in the video (Today’s topic is – Can humans colonize other planets). According to me space colonization means permanent human habitations. No space colonies have been built so far currently the building of a space colony would present a set of huge technology and economic challenges. By developing alternative location on earth the Planet species including human can live there. If we colonize other Planet it will clearly required a grate deal of technology and scientist did not know if human could survive for long period in space. Human could likely colonies the moon , Mars and other Planet. As human continue to destroy our Planet resources so it is not far to create a new colony. We everybody aware NASA scientist has been working for people can live on other Planet. As population s are increasing day by day so if people get chance to live on other Planet it will be better. It may be a progressive one for human development. As increasing global warming alerts are here, we need to search for a better place for living in other planets. This is especially for our future generation which makes their life better. It’s possible that humans could colonize other planets. Now there’s a significant development in space technologies in all countries. Scientists from all over the world try to figure out a suitable place for human living apart from earth. Many countries shown keen interest on space technology. So it is possible. But there also will be some cost of adjustments we’ve to make apart from the earth. By the year 2030, we expect that the humans might able to colonize in other planets.. That may be Mars. Yes, we humans can definitely colonize other planets if we find a suitable planet to stay at. Due to the ever increasing population there is very little space left on earth. The metropolitan cities are crowded like hell. This has developed a need to look for another place to stay in. Scientists have been working on finding another planet that may have atmosphere just like that of earth such that it will be suitable for life on earth. With the development in technologies, when people aspire to go as tourists to outer space, the next step would be to colonize so area into outer space. Yes we humans can colonies in other planets and we are continuously trying to do that. Our scientist are trying to find necessary elements for life in other planets . And one day we will surely succeed in finding life in other planet . But their is possibility we can find any alien life on other planet too . Indian scientist are also busy in doing research work related to human life on other planets. We are also continuously working on space programs too .